Was there really any doubt? The third and final installment in Hitoshi Ariga's epic Gigamix manga series is headed to the U.S later this fall courtesy of UDON Entertainment. As of today, you can now nab a pre-order of Mega Man Gigamix Volume 3 from Amazon. The retail giant is currently listing the book for a release on September 27, 2011. Given that UDON hasn't official announced the book, the date is more than likely tentative. What of Gigamix 1 and 2? As it stands, Gigamix 1 is still set for release next month, May 17, and Gigamix 2 on August 9. UDON does, however, have a bit of a history when it comes to delays so these dates may change from time to time. Simply keep a close watch, and be thankfully we're actually getting these books in English! Get your Gigamix fill at Amazon. Ariga's work is always amazing. I wonder what he'd doing nowdays. I only see him do 'gigs', like a couple of Megamix pages about MM9, and arrange soundtrack CD covers. I know he's done object and character designs for some companies, but is he in a company? Maybe he's freelance? 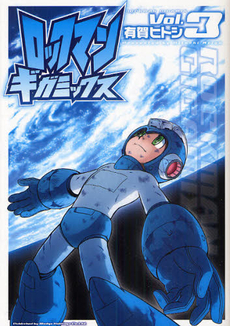 I guess I just wonder what are the chances he'd go back to doing more RockMan manga, like actually putting out more books. If that was somehow announced, it'd be the most awesome news. I'd love to meet him too. I wonder if he's ever come to the US. Hope they at least keep the cover art of the original for the American release, I quite like it. @Dhylec: Most manga are first serialized in magazines before being compiled into books, which can take months or sometimes even years to get enough chapters to publish into a book. Sure there have been SOME exceptions to this, which is extremely rare, but still. very cool but what's uo with mega man's face looks like he is agonizing!! @Dr. Jerk: Yeah, but I hadn't heard of Megamix or Gigamix being serialized anywhere. I thought it was an exception, as you'd said. I guess I should look that up.